Everybody loves OREO® cookies! 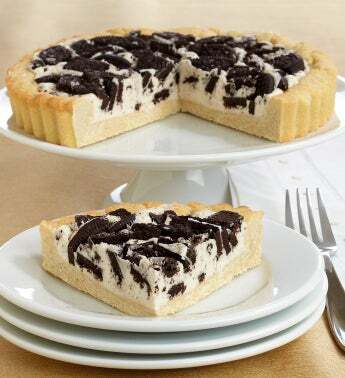 This delectable cookie pie pays homage to the famous cookie classic. OREO® cookie lovers will delight in the appetizing sweet white crème that sits atop a rich butter cookie crust and is then garnished with genuine OREO® cookie pieces for an irresistible classic treat. Each cookie pie is lovingly hand-crafted in small batches. This unique twist on a cookie classic is sure to please!